Climate change, like all environmental change, is bound to create losers and winners. That is, while some species will experience climate-driven declines, others stand to benefit. The Northern Bobwhite is one species that may be positively affected by climate change, according to Mass Audubon’s new State of the Birds report. The Northern Bobwhite is a species which reaches the northern fringe of its range in southeastern Massachusetts. According to the Massachusetts Division of Fisheries and Wildlife, Northern Bobwhites were once limited to coastal areas of Massachusetts, but likely expanded statewide following the clearing of land for agriculture during the 1820’s to 1840’s. However, a string of severe winters in the late 1800’s and early 1900’s may have wiped out bobwhites across the state, recovering only in the southeast which has milder winters. Change in Northern Bobwhite distribution between Breeding Bird Atlas 1 (1974–1979) and Breeding Bird Atlas 2 (2007–2011). 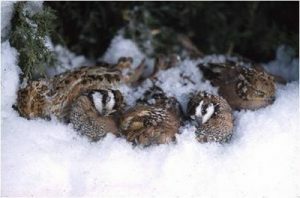 Why Do Severe Winters Hurt Northern Bobwhites? Recent research has confirmed the long-standing assumption that severe winter weather events (e.g., ice storms, heavy snow accumulation) can increase Northern Bobwhite mortality and thus suppress northern populations of bobwhites. One hypothesis explaining the negative effect of severe winter weather on Northern Bobwhites is that too much snow accumulation can limit access to the bare ground, where they forage primarily for seeds. Unlike turkeys, bobwhites cannot dig through snow to find food. Massachusetts can expect to see less snow fall and less accumulation in future winters due to climate change, and this may bolster winter survival of Northern Bobwhites and allow them to expand their distribution from the southeast to other areas of the state. However, although the climate may be more favorable for bobwhites, as shown by our maps below, successful colonization of new areas will depend on the availability of suitable habitat, such as early successional areas, scrubby field edges, and open woodlands with herbaceous ground cover. Without this, the Northern Bobwhite may continue to decline in the state. Mass Audubon’s work on the Foresters for the Birds program (of which Northern Bobwhite is a focal species) and habitat management on our sanctuaries are critical for the conservation and restoration of healthy forests and early-successional habitats and species in the state. 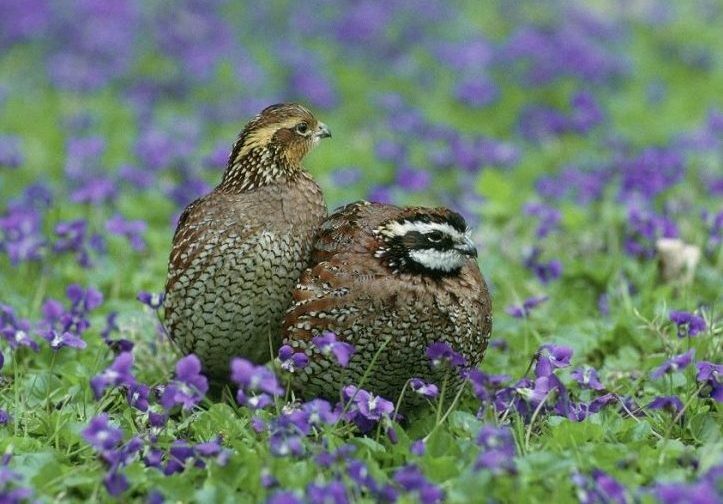 Projected climate suitability for Northern Bobwhite in 2050. This entry was posted in Birds and Birding, Climate Change and tagged birds, climate change, state of the birds on October 13, 2017 by Jeff Ritterson. When we think about a bird’s nest, we usually conjure up the image of a cup-shaped tangle of twigs and dried grass, with perhaps some moss or strips of bark, cleverly placed in a bush or the limb of a tree. Maybe that’s because these are the most visible types of nests, whose remnants are easily seen when the leaves drop each fall. Nests of other birds a quite difficult to see, even in plain sight. For example, the Piping Plover creates a just slight depression in the sand, and the Eastern Whip-poor-will nests directly on the forest floor, each with highly camouflaged eggs. 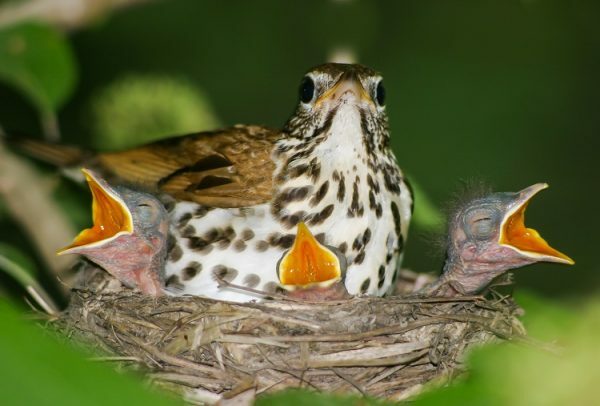 Yet another type of nest are those placed in the cavity of a tree. Many common bird species are actually cavity nesters, including nuthatches, chickadees, titmice, bluebirds, woodpeckers and some owls. Cavity nests provide protection from predators, shelter from weather events, and can be chosen with respect to the regional climate. For example, in northern latitudes woodpeckers are known to orient their cavities south towards the sun, so that their young will stay nice and toasty in the nest. 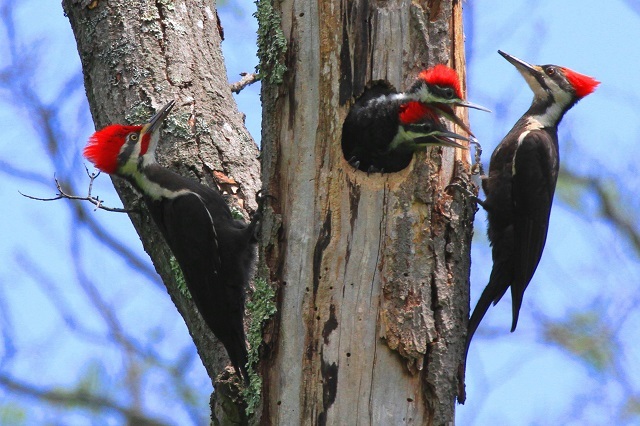 Woodpeckers are particularly important in the world of cavity nesters. 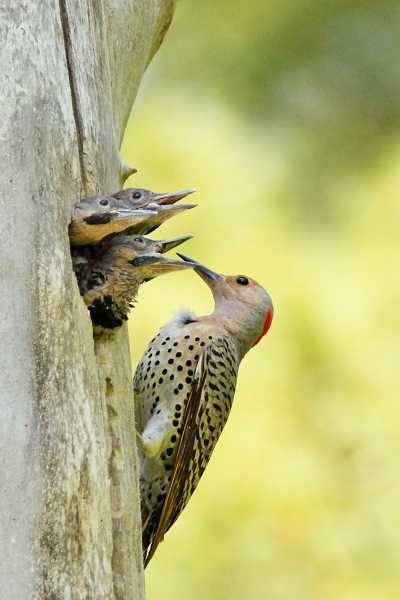 While cavities can occur naturally in trees, most species are poorly suited to excavate their own cavities, and often rely on holes created by woodpeckers. Cavities usually begin with a fungal infection, which creates a soft inner wood that is easy to excavate. This condition is most common in older dying trees, which eventually become dead standing trees (called snags) and continue to be a good resource for cavity nesters. Unfortunately, dying trees and snags present inefficiencies to timber production, and a history of land clearing and forestry practices have limited snag numbers. Meanwhile, populations of woodpeckers and other cavity nesters can suffer if there are too few cavity trees available. The good news is that forestry can also help to increase the number of cavity trees. For example, the maintenance of large dying trees and snags is promoted by Mass Audubon’s Foresters for the Birds program. 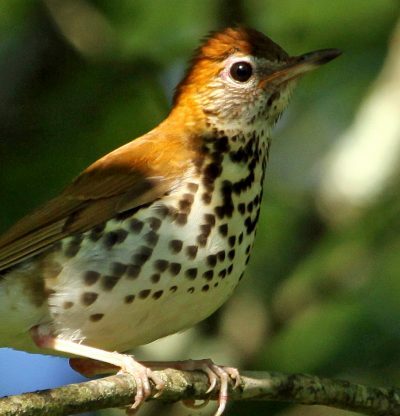 This program, a partnership between Mass Audubon, MassWoodlands Institute, and the Mass Department of Conservation and Recreation, provides assistance to landowners who wish to manage their woods for bird habitat with sustainable forestry practices. 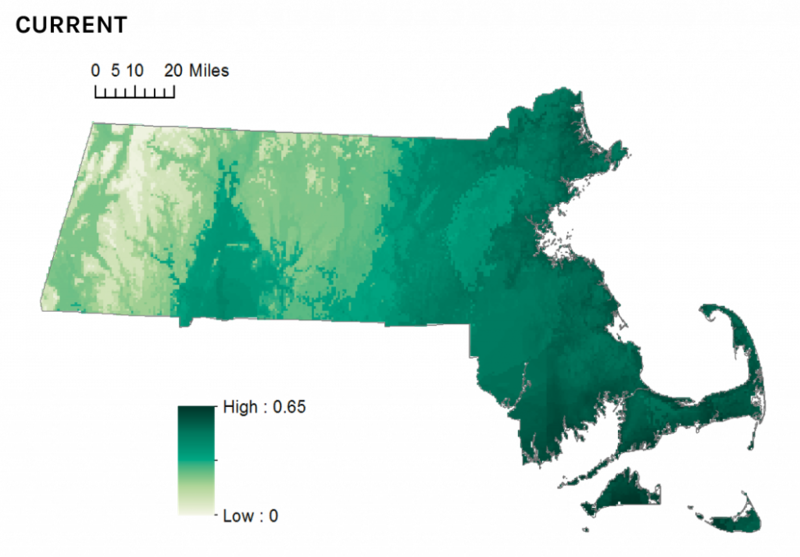 Empowering private landowners is critical because they own the majority (75%) of forests in Massachusetts. 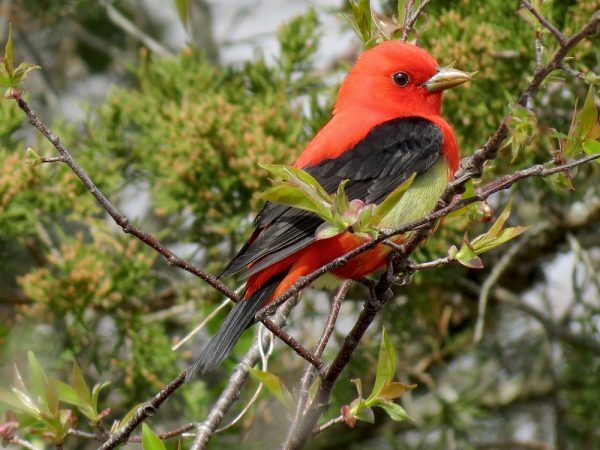 This entry was posted in Birds and Birding, Forestry for the Birds and tagged cavity nests, forest birds, Foresters for the Birds, habitat management on May 3, 2017 by Jeff Ritterson. 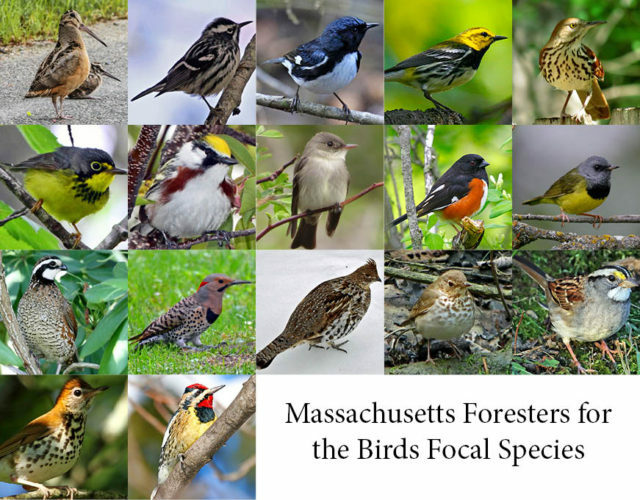 These 17 birds were chosen to represent different forest habitats and management options in the Massachusetts Foresters for the Birds program. Mass Audubon’s Foresters for the Birds program provides assistance for private landowners to manage their forests for bird habitat. 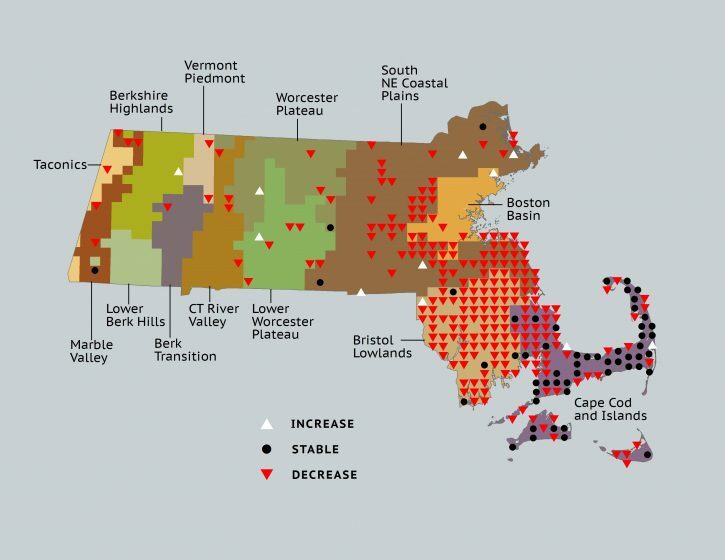 Empowering private landowners is important because about 75% of Massachusetts’ forests are privately owned, and management on these lands will be necessary to address conservation needs on a landscape scale. To promote the program, and to engage and educate the public, we are creating a long-term demonstration site at our Elm Hill wildlife sanctuary in Brookfield and North Brookfield. The first step: develop a 100-year forest management plan for Elm Hill. To do this we are working with a forester who was trained in our Foresters for the Birds program. In addition to mapping different forest resources, and describing the amount and value of the standing timber, this plan also includes an assessment of the current bird habitat and recommendations for improvement. For example, the structure of the forest understory and midstory, where many birds place their nests, are described in each area of the forest. The plan also includes strategic locations for the placement of early successional habitat. We are currently reviewing initial drafts of the plan, and working with our forester to iron out the nitty gritty details. Once the plan is complete, we will then undergo active forest management on the property (probably next year), which will include things like removing invasive plants, and selectively removing trees to improve the composition, health, and resiliency of the forest. We are also designing a bird monitoring study which will investigate how effective our forestry practices will be. Because on-the-ground management will not happen until well after this year’s breeding season for birds we have the opportunity this year to characterize how birds are currently using the forest. Comparing that data to similar data collected post management will help us adapt our future efforts to maximize the benefits to our birds. Beginning as soon as this summer, we will invite foresters, landowners, land trusts, and other conservation entities to visit the property and see how they can manage their woodlands for birds and other wildlife. Keep checking back for more updates as we nail down our plans and begin the bird monitoring. For more information about the project, see our previous blog post. This entry was posted in Forestry for the Birds, Working Landscapes and tagged bird-friendly management, birds, education, Foresters for the Birds, wildlife sanctuary on March 7, 2017 by Jeff Ritterson.